Benefit from our useful tips, FAQs and guidance on our Rubbish Removal services in London. 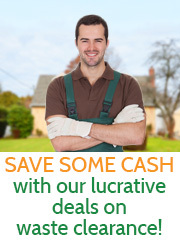 We are at your beck and call to provide you with the most efficient service when you are in need of professional help. Whether you are a commercial property owner or domestic client in London, we can help you and give you the most competitive price locally. Step 1: Get in touch with us and discuss your needs with our team or send a picture of the junk you want to get rid of. Call us on [PHONE NUMBER], e-mail us at [email protected] or chat with our knowledgeable team via the live chat window below. 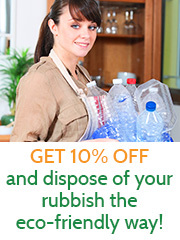 Step 2: You will get a FREE no-obligation quote based on the kind and amount of rubbish that you want to dispose of. Step 3: We set up a rubbish removal appointment at a time and date convenient for you. We can provide you with efficient rubbish disposal services seven days a week! Step 4: Our waste disposal experts will visit your property and estimate the quantity of junk you want to get rid of and offer you a final estimate. The final price will be formed by calculating the costs for transportation, labour and rubbish disposal. Step 5: We will get on with the job as soon as you accept the quote. Note: You will be charged additionally if we have to safely dispose of items that require special treatment such as: TVs, refrigerators, freezers, air conditioners, microwaves and car tyres. Note: The price for the disposal of heavy construction waste and renovation materials, such as timber, wood, rubble, cement and soil will be calculated based on their weight. Note: You need to provide us with detailed information about the amount and type of items you need disposing of, their location in your property. Please let us know if they have to be disassembled.